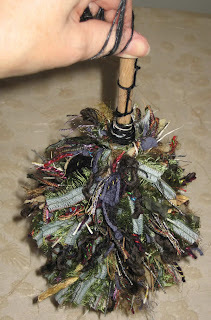 The question of the week seems to be, "Can one make art yarn with spindles?" My response takes up more than a couple of sentences, so I'm posting here where I can wander a bit. If you want a simple answer, that answer is yes. You can leave now to continue your stumbling in the dark. If you'd like to explore a bit deeper, read on and/or continue searching within yourself for the aspects of you that generated the question. First - if you are wondering if something can be done, why isn't your response to simply try and then observe the results. If you have asked a question, doesn't it seem that there is desire to know/explore an area? If you asked the question in a public forum and people responded, no it can't be done, would you not bother to try? Why would you accept someone else's answers? In an area such as spinning, it's not like there are huge mistakes that can be made (these days.) No one will die if you try to spin a yarn and it doesn't work out the way you envisioned. You don't have to make a huge financial investment to try spinning what you're thinking about. You invest your time and then you know whether it can be done by you (at this time) or if you need more knowledge and/or need to find a teacher. My second thought is - do you know what you are actually asking about? "Can one make art yarn with spindles?" What does the term "art yarn" mean to you? How do you define the term? I ask, because I have never seen a definition that satisfies me, that differentiates "yarn" and "art yarn" in any meaningful way. (I have written about this topic before.) Is there a reason for making these distinctions? For me there isn't. Often, calling one's yarn an "art yarn" seems to be done to cater to those who have a superficial understanding of creating/spinning in the hopes of making more money from the product and/or purporting to have a level of experience that one might not actually have. 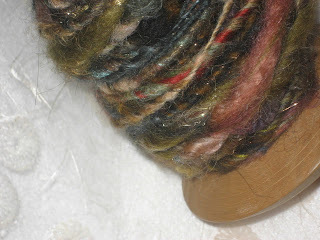 I would say that I can make all kinds of yarns on spindles and wheels and I also teach others to do so. Candace Crockett, Mabel Ross and Diane Varney have all written excellent books on spinning and have shown techniques for manipulating fibers in creative ways. One can adapt these techniques for use with spindles and wheels. These techniques are kind of a paint by number approach. After learning technique - what to do with your hands and what to do with the fibers and tools - what's next? Maybe one continues to refine technique, seeing how these techniques play out using different fibers, creating different weight yarns. This, in itself, could occupy a lifetime's worth of fun and experimenting. There are so many variations on types of yarn that can be created that one could be amused forever. If one is attracted to any of the aspects mentioned in the previous paragraph, there are ways of interacting with them. One can look outside to what others have done. Why anyone would emulate or try to copy other peoples expressions is beyond me. Each of us has our own song, and singing anothers song, appropriating their work, can lead one away from one's self. If one wants to live on the surface of life and/or is happy to try to live someone else's life other than her/his own, maybe it will be a sufficient amusement. Another way is to create from one's deep self, from one's experience of being on the Earth in this, our individual body in this time/space. That goes far beyond technique, and is an interaction that can tap into the most sacred of spaces, into all that humanity has explored and is currently exploring - experiences that fuel our most important human stories, our interactions with all the spirits of the Earth and our souls. One can learn so much by creating in this way, by allowing experiences to manifest themselves in spun fiber, to allow this fiber to be a holder of knowledge and energy. Can the above be taught? I think that if that is the way one lives one's life, seeing each task and day as potentially sacred, the yarns that one creates will be a reflection of this. A teacher can help you to access these places in yourself, can point out some things that you might not have noticed and the possible significance for you. Love it! very helpful thank you. Will now follow your fantastic blog. Very thoughtful comments. I love your writing and your work.